As always Melissa, such a well written post and beautiful photo. Just what I needed to read today, too. Thank you! How funny, both you and I were considering culinary negotiation and diplomacy today – though I must admit, your musings are far more well-realized! Lovely combination of colours and texture in the photo; absolutely delectable. I love, love, love kunefe. I can’t wait to try this recipe! Thank you for posting it. Melissa,"There is a communication of more than our bodies when bread is broken and wine is drunk. And that is my answer when people ask me: Why do you write about hunger, and not wars or love." — MFK Fisher. A delightful story, and a tempting dessert! I would fully agree with the concept that sharing meals could bring so much more understanding. Like you, my first here on an American university campus, I ended up in the French House (and it was really called this way) sharing meals and food cultures with 9 other people. And that was an incredible life experience. what a beautifully wtitten post. i’d love to get my hands on some of the kataifi pastry some day! sign me up for any desert containing mascarpone! Melissa – your post just made me ‘homesick’ for Edinburgh – for the first time since I moved back to Estonia just under a month ago:)I spent three years in Churchill house (moving from kitchen 8A to 6B to 8A again), and these were some ofthe greatest years of my life! I miss those kitchen (potluck) dinner parties.. I remember teaching various guys how to cook (I can remember especially well an incident involving one Egyptian guy and a lonely blue chicken in a heavily boiling water in kitchen 8A; he later progressed into making a decent chicken stew. I try not to remember one Taiwanese flatmate boiling kidneys early one weekend morning:) Those three years increased my culinary horizons enormously, and I have various Chinese, Italian, Taiwanese, Greek, Russian, Egyptian, Canadian, Middle Eastern, Mexican, Colombian etc dishes in my recipe repertoire that I learnt from my various ‘kitchen mates’ over the years. Thanks for mentioning me, it’s very kind of you. Melissa, your künefe looks delicious. I think I might surprise my hubby with this.In Turkey we use a saltless cheese. Unfortunately you can’t find it in Europe that easily, try turkish markets and ask for "tuzsuz beyaz peynir, from Hatay or Urfa". Ricotta and mascarpone mix comes close. The kaymak, the very fat and solid clotted cream, is only to top künefe with after baking. Ana Sorgun made a mistake there. what a treat – both your stunning kunefe and the fact that i have two scrumptious posts to digest in one sitting! for me, just about the only positive thing to emerge from awful dining options in college was that it was hugely motivational in learning how to feed oneself! What a nice story! I had kunefe before its delicious, thanks for the recipe. I think I may have had a similar pastry in Cyprus- the pastry part looks like shredded wheat cereal a bit? I will have to see if kunefe is available in one of our markets-I particularly love rose flavored things (a taste I’ve only recognized lately) and pistachios, and mascarpone. This pastry is calling my name. If your photos are any indication, you have a fabulously rustic styled kitchen. Have you ever posted a picture of it? I’m curious! Good food, good music, dancing, and rainbows. Maybe butterflies, too. These are the things peace is made of. I’m a care-bear like that. The one with the rainbow on its belly. ;-)Over here we’re starting to prepare for the 2007 International Salsa Congress in Israel which will use all of the above (well maybe except for butterflies) to bring a little bit of the unity that is so sorely missed into this region. Just for one weekend, if only that. Watch out for April when the congress is on. Ahhhhh… it’ll be awesome. Hopefully we’ll host a few more friends from Jordan this year! 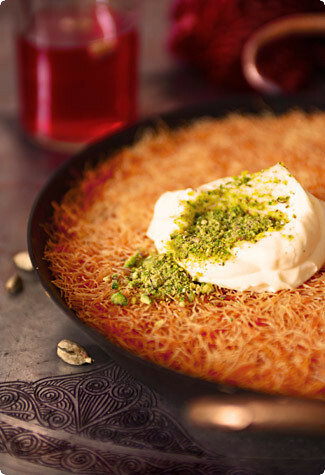 Yay!This kunefe (here it’s called knafe) looks absolutely scrumptious! I am amazed every time I read yet another story that proves food really is the tie that binds. A lovely post, Melissa! The dish itself looks amazing but it’s the champagne rose syrup that really has my curiosity piqued. Melissa, your narrative always fills me with a lot of positive attitude/energy.Not only by its content but also by the sheer power of your words, so precisely chosen. In this very occasion, as I progressed throught the text i can visualize myself gathering all the ingredients to attempt this new recipe. What power!! Thank you for sharing all your enthusiasm, knowledge..and wonderful way of looking at the world. I am happy to read about this pastry, specifically because it is best eaten directly out of the oven (as opposed to after sitting) since that is when I am most apt to attack it. Thank you for this – I’ve just moved to switzerland and i’ve been dying for something really sweet!! Lovely post for a holiday season (in the US) that’s all about food bringing people together. Must admit, very impressed. The pic almost made me feel like I can smell the dish. yum. Have just found and been browsing your blog, and am really enjoying all the recipes and food discussions.However, I’m moved to post because I’ve just moved to Edinburgh for my PhD, and am living in Churchill House (your post gave me quite a shock!) While my kitchenmates don’t tend to cook together much, since we all seem to have completely different body clocks, we recently had an international dinner party. I can only echo your opinions. My only complaint about the city thus far is that living near Tesco has rather shrunk my culinary horizons. (My budget can’t cope with Peckham’s too often.) I’m currently on the hunt for a red cabbage. and a reliable source of ricotta chese, although Lidl has provided me with celeriac.My apologies for the ramblings – it was just quite eerie to discover your background! A beautiful post, and an intriguing notion about the power of dining together to help people over the cultural barriers. Perhaps we could pass this idea on to our political leaders, who surely could use some help in finding common ground…. Thanks a million for this recipe!Kunefe is one of my two all-time favorite desserts. The other is Thai "Sticky Rice with Mango" or "Mango with Sticky Rice", depending on the proportions and cook/diner preference. hey there !!! i stumbled upon your webssite yest while searching for the perfect macaron recipe…ad i can successfully say u have managed to drive me away from all notions macaron like… =D i was up till 3 am readin pretty much all your recipes… I must say iwas quite intrigues by this particular one. Currently residing in the middle east, and ahving pretty much grown up i have eaten my fair share of kunafa as they call it , from the horrid stringy cheese ones to the soft melting pools of sweet butteriness. im very intrigued by your rose syrup.. although since we dont consume alcohol here im afraid champagne or aything o that sort is a no go..any idea what i could substitute for it? Another great trick we try in our house is Jack cheese and ricotta mixed together, we find it works really well since one melts quickly and the other is soft. ( Plus the saltiness of the Jack is amazing with the syrup!!) Another trick is to add a little dusting of cinnamon in the filling, just a touch to add warmth. It really makes it something special!